Tusayan, Ariz. – Fire officials on the Tusayan Ranger District of the Kaibab National Forest are managing two new fire starts called the “Scott” and “Airstrip” fires. The Scott fire was discovered June 28 and has grown to approximately 5 acres in size. 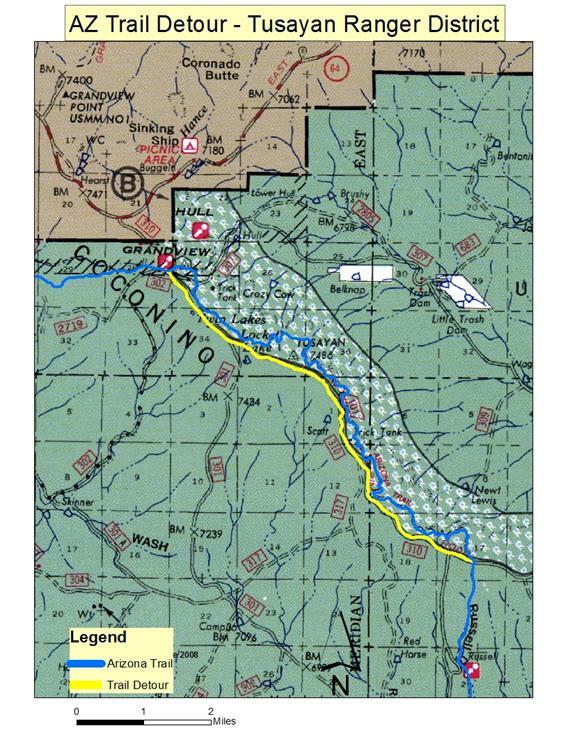 It is located in a remote area on the Coconino rim near forest road 310, 11 miles east of Tusayan. The Airstrip Fire was discovered on June 29 and is currently 6 acres in size. The Airstrip fire is located just south of the town of Tusayan on the east side of highway 64. The Scott Fire is burning in a pinyon juniper and ponderosa pine fuel type on the northeast slope of the Coconino rim in the Upper Basin. A temporary detour has been put in place on a section of the Arizona Trail between the Grand View lookout tower and forest road 311 north of Russell tank. Trail users are asked to follow directions posted along the trail and avoid areas where active fire is present. The Airstrip fire is burning in a predominant ponderosa pine stand adjacent to the Grand Canyon airport and will be visible from the community of Tusayan and from highway 64. Both fires will be allowed to move within a predetermined planning area for the purpose of reducing hazardous fuel accumulations and restoring overall forest health. By allowing moderate ground fire to clean up this critical piece of forest south of the developed areas, fuels loads will decrease creating a safeguard in front of the community. The end result will reduce a future threat of a potentially devastating wildfire running straight toward the town from the south, he added. Weather conditions are expected to vary on a daily basis which will influence changes in fire behavior and growth patterns as both these fires begin to progress. 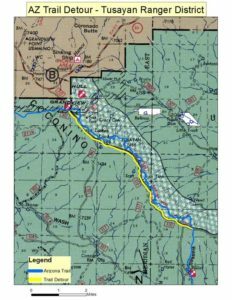 Smoke may be visible from the Grand Canyon village, the communities of Tusayan, Cameron, Valle, and from Highways 64 and 180. Fire managers will monitor smoke impacts closely and will employ extra measures as necessary to minimize smoke impacts to the surrounding residential areas. Text Message – text ‘follow kaibabnf’ to 40404.